Huge thank yous to all of the Sponsors & Partners that make this stewardship event possible! 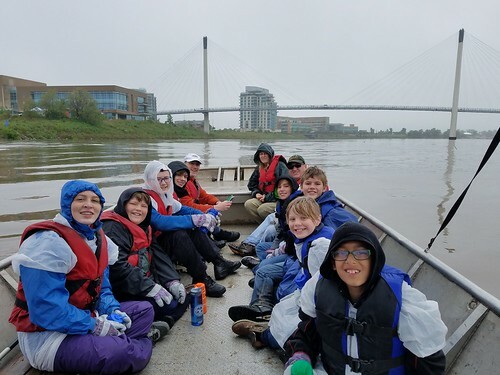 On Saturday, May 20th, together with our community clean-up partners and volunteers like you, we returned to downtown Omaha to remove tons of trash from the banks of the river. 150 dedicated volunteers showed up in the steady rain to help make a visible and lasting difference on their environment, the Big Muddy Missouri River. With smiles and gratitude, Thank You SO Much for helping us make it happen! In a steady, cold rain, 150 AMAZING volunteers arrived at the downtown Omaha riverfront to clean-up the Big Muddy! 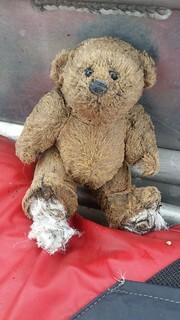 For some of the volunteers, like the Boy Scouts for instance, this was their fourth time getting out on the river with Missouri River Relief. This was our fifth time cleaning up the Missouri River around the Omaha/Council Bluffs Metro area. 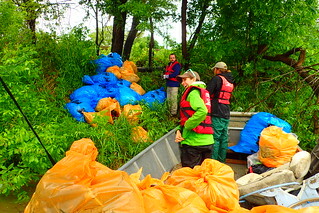 We partnered with Fontenelle Forest to tackle mounds of trash deposited by the 2011 flood along Manawa Bend a few days before the big community clean-up, where we netted an additional 1.75 tons including a refrigerator, 1,000 gallon plastic tank and a tractor tire that weighed more than 100 lbs! The event, sponsored by Back to the River, was followed by a 2-day Educator Workshop with River Relief Education Coordinator, Kristen Schulte thanks to a 2-year EPA grant Missouri River Relief has been integrating into our education programs. 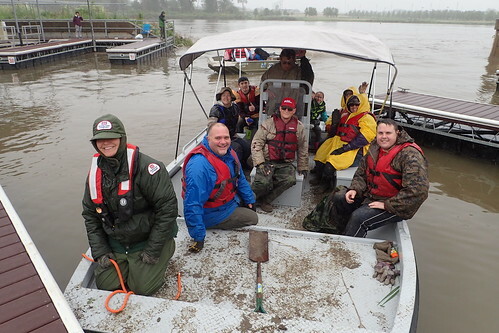 Agency boats from the Nebraska Game & Parks Commission and the U.S. Army Corps of Engineers helped shuttle volunteers in the dreary rain to help us remove more than 6 TONS of junk from the river! 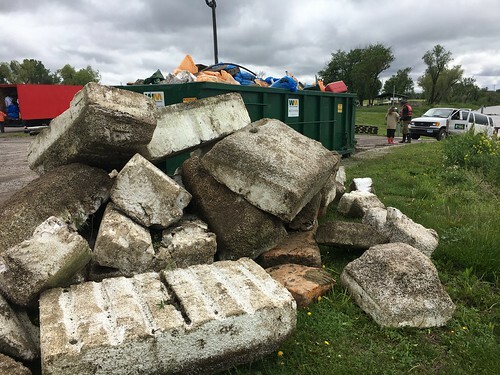 We initially thought it would weigh in at around 10 tons, but if you check out the trash tally, there was boatload, after boatload of large Styrofoam blocks filling our dumpsters. 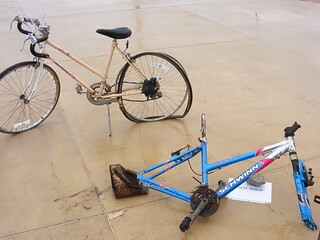 Many sites were abandoned homeless camp dumpsites along the river. The population of transients using the river seems to be going up, although the Omaha and Council Bluffs riverfronts have always had many people living there. This is touching and very emotionally difficult work to do. Our volunteers worked so hard and put their hearts right into it. We also had a group of Boy Scouts from Troop 326 (pictured above) who cleaned up more debris left from the Sandpiper Cove Marina which was tragically destroyed in the 2011 flood. More folks cleaned under bridges and also the network of trails under the pedestrian bridge. Everyone came back for a hot pizza lunch donated by Domino's Pizza. 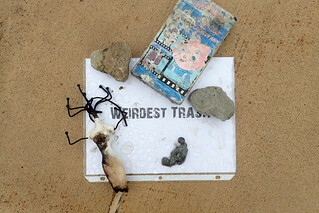 Then we had a really amazing Trash Contest with some truly odd finds. Check out the Trash Tally below. Thanks to all of our amazing Sponsors! None of this would happen without dedicated sponsors, who donate cash, supplies and hard work to keep this river clean-up project humming. Check out our collection of photos from the day~! There might just be one of YOU!